In 2004, Nike SB approached Girl Skateboards’ team manager/artist, Sam Smyth, to design a dunk for it’s “Team Manager” series. After tapping Nick Tershay of Diamond Supply Co, the duo created two designs. One colorway which represented Red for Fire, Green for Weed & Black for “RESN” – Smyth’s moniker with the IBC Crew in San Francisco. And second, a “Tiffany”, silver and black color way, colors Tershay had already utilized in his Diamond line. Both designs were approved, but in July 2005 Nike SB, for unknown reasons, only released the Diamond SB Dunk. Very few samples of the RESN SB Dunk were made available, which became prized possessions for collectors world wide. But next month, the highly anticipated shoe will be making its retail debut. 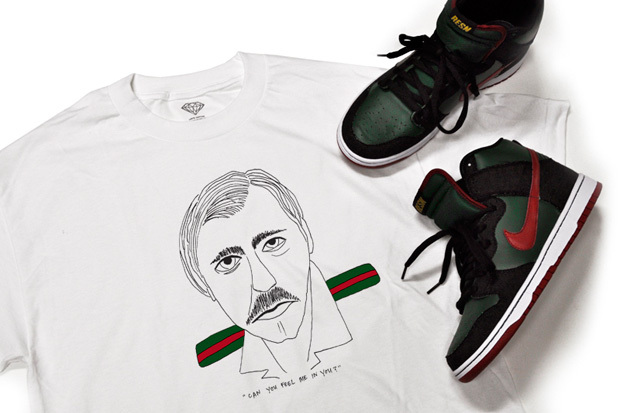 Partnering with Diamond Supply Co, “RESN” designed a special-edition T-shirt emblazoned with the image of Casino’s Lester Diamond and his Gucci jacket with green and red epaulettes to match the Dunk. Diamond Supply Co. Officially Unveils Nike SB Dunk Low "Diamond"
In a dark and largely muted palette, Givenchy’s seasonal bag collection is presented here.